Good morning. Ohayo Gzaimasu. Assalam-u-alikum. 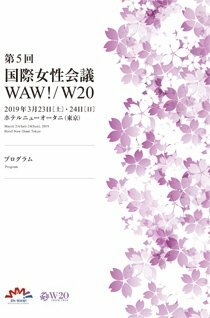 Mr. Prime Minister and Mrs. Abe, Vice President Michetti, High Commissioner Bachelet, distinguished guests, people of Japan —thank you so much for the warm welcome to your country and for inviting me to speak at this year’s World Assembly of Women. I amso happy to visit Japan for the first time and grateful to Prime Minister Abe for inviting me and speaking with me yesterday about the importance of girls’ education. I appreciate his leadership for the women of Japan and for women and girls around theworld through his focus on the Sustainable Development Goals and Japan’s aid to education. I am also grateful that he and Mrs. Abe were so kind to me last night at dinner when I accidentally ate a large portion of wasabi. I had never tasted anything like this! My eyes started to water and I struggled to keep my composure in front of this distinguished company. But they were very kind to me! This morning I looked out my window at a beautiful garden below —the green grass, streams and trees. The beauty of Japan reminded me of my home in Swat Valley, Pakistan. I spent my childhood in a peaceful place sometimes called the Switzerland of the East. I loved walking through the streets and laughing with my friends. My little brothers had pet chickens. My mother shopped in the local markets with our neighbors. My father was a teacher. My greatest joy was studying and going to school. But everything changed when extremists took over our town. They banned many things —like owning a television or listening to music —and they enforced the harshest punishments on those who defied their orders. And they declared that girls could no longer go to school. In January 2009, when I was just 11 years old, I said goodbye to my classmates, not knowing when —if ever —I would see them again. At that moment, my father and I knew we had to speak out —because we knew that life without education meant my friends and I would have no future at all. No chance to pursue our own dreams, no chance to offer our contributions to the community we loved. And the extremists did target me for defending my right to education. But they failed. They only made my voice louder —and today I am here to speak to all of you on behalf of 130 million girls still out of school. Many of those girls look at my story and have hope that they will go to school, complete their education and choose their own future. And many of the women in this room are here because we were inspired by women who came before us. Women like Grace Hopper, a pioneer in computer programming. Japan’s first female astronaut, Chiaki Mukai (CHEE-AH-KEY MOOK-EYE). Or Benazir Bhutto, the first female Prime Minister of Pakistan, who was my inspiration. You are here because someone believed in you, like my father believed in me.Because you took advantage of the opportunities presented to you. Because you fought for your ideas to be heard. And most of all, you are here because you had an education. But —unlike you and me —millions of girls around the world are unprepared for the modern workforce. If we hope to create a world where all women can shine —where more women are driving innovation, holding seats in government or running companies —our leaders must invest in girls’ education. We know that girls trained in STEM can produce extraordinary innovation. In Ethiopia, 19-year-old Betelhem developed software to help schools with limited internet to access the resources their students need to learn. In South Africa, 18-year-old Kiara found a solution to hydrating crops during droughts. And tomorrow I’ll meet Kanon, an 18 year-old from Chiba, Japan who founded a robotics team in her high school. But right now we are only seeing a fraction of what young women like these can contribute. As technology changes the way we live, learn and earn, almost one billion girls lack the skills they need for the modern workforce. Last year, Malala Fund and the World Bank published research showing that if all girls completed secondary school, they could add up to $30 trillion to the global economy. Many students entering classrooms today will work in jobs that don’t even exist yet. That means we must invest in girls today to ensure that women can succeed in the jobs of tomorrow. Five years have passed since our leaders agreed to the Sustainable Development Goals including 12 years of quality education for all girls. Unfortunately, we are far behind in making the necessary investments to fulfill these promises. This week I’m asking G20 leaders to commit new funding to give girls 12 years of education and the skills they need for the future workforce. As the hosts of this year’s G20,Prime Minister Abe and Japan have the opportunity to lead on girls’ education. I can’t think of a better legacy for this year’s summit or a better gift for Japan to give the world. Prime Minister Abe cannot do it alone. We need all G20 heads of state, business leaders and advocates to join this fight. We have the opportunity to help millions of girls go to school —and we must take action. I was one them 10 years ago —and I have no doubt about this: if we invest in girls today, a future beyond our imagining is possible. Arigatou.